The heartbreak of a good biography is finding out that the artist whose work sings to you is not the person of your imagination. It’s almost like a friendship breaking up over irreconcilable differences. The joy of a great biography is reveling in all the nooks and crannies of the artist whose work speaks to you. Mark Dery’s representation of Edward Gorey’s life is well-researched—including interviews with friends, family, and colleagues—and often feels too intimate, probing as deeply as possible into an ultra private man whose public persona was a purposeful put-on. The brilliant title and chapter headings are Gorey-esque: A Suspiciously Normal Childhood, Sacred Monsters, Epater le Bourgeois, Nursery Crimes, etc. Dery has sectioned Gorey’s life into childhood, education, career moves, and his various obsessions, the main ones being literature high and low, silent movies, and the ballet choreography of George Balanchine, with their corresponding closely-knit fan groups. Any Gorey fan can learn something new in this biography, for the man was quite complex, and he apparently needed little sleep, working on something every moment possible, from his little books sold successfully at Gotham Book Mart, through his book cover art and collaborations, to his work in theater and television. Though far from an open book, Gorey’s career flowed easily through profound and lasting friendships, Dery presenting the development and arc of such friendships with a light touch. 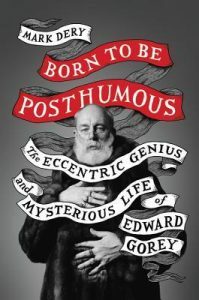 Themes running throughout the biography are Gorey’s complex parental relationships, his tendency to keep himself to himself while handing out sardonic opinions like candy, and speculation upon his sexual orientation. Though he’d answered the question of his sexual orientation, speculation continued, with “evidence” pointed out in his work and life. Though Dery may reference the evidence and speculation a bit much, he offers a comprehensive gathering of Gorey’s work and a well-thought-out timeline of his life, with a wonderful takeaway that Gorey made his art to please himself. It’s a must-read biography of a man as interesting and mysterious as his little books of Victorian / Edwardian children suffering unusual demises. Little, Brown & Company graciously sent me an ARC of this fantabulous biography for an honest review.